Outlying islands, quaint villages, sandy beaches and undulating mountain paths: explore the real wild side of Hong Kong! Citylife and cityscapes – Asia’s world city is the ultimate urban destination. But contrast is never far away. Nor are the outlying islands, quaint villages, sandy beaches and undulating mountain paths. Take a break from the hustle and dazzle to explore the real wild side of Hong Kong! Most of Hong Kong’s population do their best surfing on the Internet, but on the weekends a fair few of them head to the island of Cheung Chau to enjoy the beaches where an Olympic windsurfing champion once trained. Lee Lai-shan (or ‘Shan Shan’ as she is affectionately known locally) brought back Hong Kong’s first Olympic gold medal from the Atlanta Games in 1996. 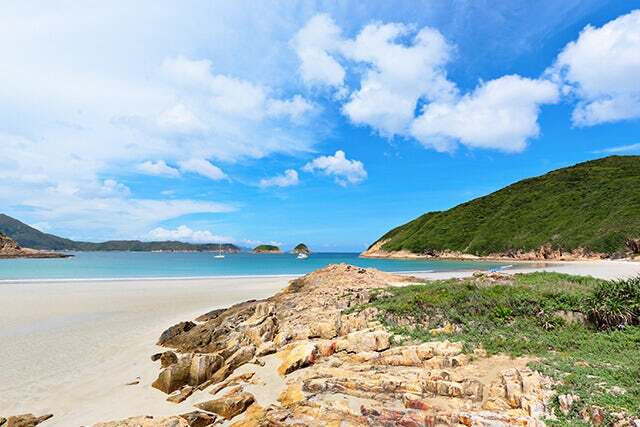 When it comes to beautiful beaches, the village of Pui O can boast two contenders: Cheung Sha Beach, one of Hong Kong’s longest; and Pui O Beach. Head to either one for a cooling dip, to make some new friends, or to just chill on the sand for a few hours. There are also a few eateries nearby, so you can stick around for the sunset with a contented stomach. Not only does the Dragon’s Back score high for its cool name, it has also been voted the ‘Best Urban Hiking Trail in Asia’ by Time (Asia Ed.). A short hop from the bustle of Hong Kong East, the trail provides stunning views of Shek O, Tai Long Wan, Stanley, Tai Tam, and the South China Sea. The top thing to do in Hong Kong is to ogle the world-famous vista of Victoria Harbour from The Peak. Some of the best views are on the Peak Circle Walk, which winds around the highest point on Hong Kong Island. This hike offers the unique Hong Kong experience of enjoying the contrast of beautiful natural environments and bustling urban ones. This trail runs along the leafy slopes high above the city’s downtown and twists around into woodlands above the south side of Hong Kong Island. From viewing a forest of skyscrapers, you will hike into an actual forest. Hoi Ha Wan translates as ‘Bay Beneath the Sea’ and the Hoi Ha Wan Marine Park is a protected area that contains 60 types of hard coral and 120 species of coral fish. It’s also a particularly good spot for those interested in snorkelling or mangroves. From the rustic Hoi Ha Village, follow the upwards path passing an old temple and a lime kiln (coral was once used in the production of lime) until you have a broad view of the bay’s shimmering waters. Then take a left down a flight of steps to a pier. If the day is clear and the tide is low, you should be able to see coral heads poking through the water. These are brain coral, earning this un-poetic name from their round shapes and convoluted surface patterns. You should also be able to see various colourful fish swimming through the coral, but you might wish to take a closer look by renting snorkelling gear back at the village. You don’t have to be a rock buff to enjoy the Hong Kong Global Geopark of China. Located in the East and Northeast New Territories, the park includes the Sai Kung Volcanic Rock Region and the Northeast New Territories Sedimentary Rock Region and showcases Hong Kong’s timeless and eerily beautiful landforms. Hong Kong Wetland Park is a world-class ecotourism park that's a fantastic spot for people to enjoy some of Hong Kong’s unique flora and fauna. But it also plays an even more important role, working to help conserve a vital ecosystem as well as educate the public about environmental protection and wetland conservation. The park is home to an impressive cast of wildlife, including birds, butterflies and dragonflies, amphibians, reptiles, mammals and fish! Check out our deals to Hong Kong!